AstroNova, Inc., (NASDAQ: ALOT), a global leader in data visualization technologies, today announced that its QuickLabel® business unit has launched the first of its second-generation Kiaro! digital inkjet color label printers, the Kiaro! QL-120. The QL-120 combines high resolution with the industry’s fastest print speeds, giving business owners a powerful tool to produce professional-quality color labels in-house and on- demand, at a fraction of the cost and time of outsourcing. Built on AstroNova’s proven industry-leading Kiaro! 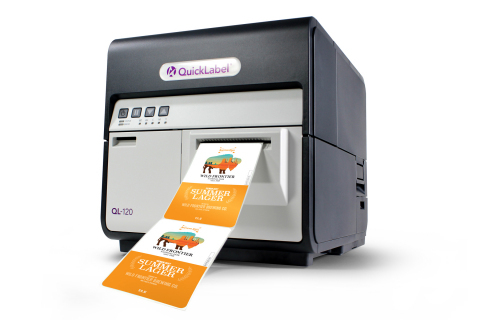 digital color label printing technology, the new QL-120 delivers enhanced print quality, performance and reliability. With the QL-120, print speed has been increased by 50 percent to 12” (305 mm)/sec and a new high-speed auto-cutter is now standard. Other benefits include the ability to print narrow widths as small as 0.5” (12.7 mm), seamless networking capabilities and extended printhead life. At a resolution of 1200 dpi, the printer ensures that even the smallest font sizes and images look crisp, while superior color management capabilities yield brilliant, true-to-life images. The QL-120’s durable ink formulation has an exceptional color range and allows printing on a wider variety of materials. Because the printed label is more resistant to water, oil, and solvents, the QL-120 is ideal for a broad range of applications from food and beverage, to chemicals, cosmetics, medical and industrial labeling. The QL-120 is available for commercial shipments worldwide beginning today. For more information, visit https://www.quicklabel.com or contact (877) 757-7978 or (401) 828-4000 ext. 9638.